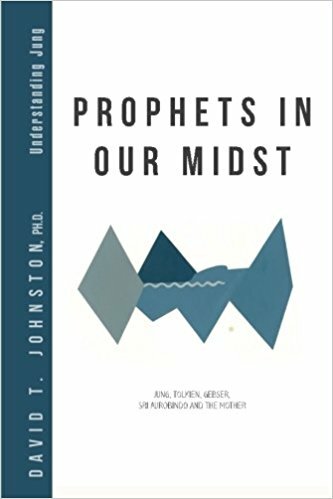 What caught my immediate attention of David T. Johnston’s book Prophets in our Midst: Jung, Tolkien, Gebser, Sri Aurobindo and The Mother were two aspects of its title: one that it was about prophets and, more importantly, that it specifically mentioned Carl Gustav Jung. Now I may have already in my first paragraph alienated those who believe and follow gurus as well as all those who have their hearts set on the fantastical worlds created by the author of the immensely popular The Lord of the Rings series. But I must confess that I have (had?) little personal interest in either of the two aforementioned. I have come to see most gurus (I do keep an exceptional clause or small window open for the possibility of authentic ones) as, if not outright frauds, then people with fraudulent tendencies. Part of this stems from my suspicion towards those who claim to have the answers and all of this has a rather claustrophobic cult feel to it. Many so-called gurus have been unmasked and many soi-disant spiritual leaders defrauded by having their motives exposed en masse, be it that they were merely driven by a greedy and ambitious quest for control, power or money or all of the above. My second hesitation regarding embracing Tolkien is more a matter of personal taste. I am not a fan of fantasy (sorry I don’t like Star Wars either), mainly because I do not clearly see its relation to the real world and hence it has little interest to me. Also, works of the genre are often embedded in and burdened with shallow characters and then lose any artistic or literary merit they could have had. Yet if it may come as a slight solace for the reader, Johnston manages to challenge (some of) my assumptions and may have shown me that I was somewhat hasty in my quick pronouncements. Let us start with my main point of agreement, however: The importance of Jung and his insights into the human psyche and our relation to the world. Recently, I have been interested in psychoanalysis and Freud’s theories and techniques have helped me uncover and discover certain psychological issues and tendencies; Freud’s theories have helped me diminish and, in some cases, even eliminate main sources of anxiety and this has led me to a much healthier sense of well-being and identity. Hence, I was all ears to approach his major disciple Carl Gustav Jung who eventually fell out with the great founder and father of psychoanalysis. As Johnston points out Jung’s approach to therapy involves individuation, which entails the quest for one’s unique path towards becoming whole. That could be achieved by identifying with the Self, the cultural and spiritual archetype of the center of the psyche that is connected with our collective past and, even beyond that, with infinity. Yet that would occur only with acceptance of all aspects of the self, including both good and evil as well as the abolition of the limited and limiting conscious ego, the often arrogant and nagging voice of know-it-all droning inside our heads. According to Johnston, in these troubled and troubling times, it is necessary for us to undergo a cultural renewal and that this is both a challenge but even more a new opportunity to attain higher spiritual levels. Using Jung as a blueprint, the author synchronizes and amalgamates certain aspects of Hindu philosophy represented by Sri Aurobindo and The Mother as well as theories by Swiss philosopher, linguist and poet Jean Gebser (although he comes up rather short in this collection of essays) and, more abundantly, the creative works of Tolkien. What all of them have in common is the quest for a prophet as a guiding voice and light towards becoming a fuller and more authentic being in a world that seems to bury us in an artificial world of technological prowess, hence robbing us of our uniqueness and spirituality. At various times, Johnston reiterates that the current post-modern world we inhabit is one-dimensional and center-less and that it is fomenting narcissistic desires and behaviors while blocking access to the deeper and more profound recesses of our selves, namely the Cosmic Self as described by the different thinkers / prophets discussed in this book. Both Tolkien and Jung present the Christian paths of reaching that higher spiritual stage, yet they also remind us that we ought to revise Christianity in order to be able to do so. Essential to this view is the necessity of free will, which can lead to the right path, yet it can also lead us to inferior moral choices including the propensity for committing evil acts. These types of choices are illustrated and embodied in Tolkien’s magnum opus The Lord of the Rings. One of the shortcomings of the mainstream and traditional Christian view lies in its conception of polar opposites, such as good and evil. Yet according to these thinkers, in reality, it ought to reflect a more harmonious whole, where both sides are acknowledged within the same structure, not unlike the yin and yang of Taoism and where the Self is not bound by dogmatic and rigid views on morality. Put differently, we need a creative synthesis, a combination of parts of both, something Sri Aurobindo refers to as the psychic being, the incarnated soul, while Jung names this a new way to fulfillment and wholeness of one’s personality, represented in Jung’s creation myth as the Transcendent One. This understanding of divinity would include both the god Eros and the goddess Logos that reside in our respective unconscious and they represent both masculine and feminine aspects of the Self. They ought to be embraced and allowed to co-exist in equal measure as a harmonious and complementary whole. To give an example, Christianity is ruled by the Holy Trinity, hence the number three being its symbolic expression. They are the Father, the Son and the Holy Spirit. And, in fact, they are all conspicuously male. However, the dove, a symbol used for the Holy Spirit, is generally female. In Gnostic tradition, the Holy Spirit was viewed not only as feminine but also as the embodiment of Sophia, the carrier of the Word and divine wisdom. Yet these symbols include and reflect also the other part in its kaleidoscopic and androgynous intrinsic self. The dove may be outwardly feminine but inside it is masculine and represents conscious thought as well as messages from the spiritual realm. Similarly, the serpent is outwardly masculine and phallic, but includes feminine receptivity towards desire. In fact, in Gnostic tradition, the serpent is seen both as wild beast and holy counselor, a relevant and indispensable symbol of wisdom. The problem with traditional Christianity is then twofold. On one part, it is the denial of feminine qualities (with the possible exception of the Catholic view of the Virgin Mary that provides a subsequent injection of femininity) and on the other hand, it is the repression of the darker parts of one’s being. However, to become whole, one should not repress (which only complicates and aggravates matters) but rather accept and then liberate the darker side of one’s psyche. According to Sri Aurobindo, the numerical symbol of the harmonious self or the Truth-mind is not the trinity represented by the triangle, but rather the square that is fourfold in nature not unlike the Hebrew Tetragrammaton or the Tetrad of Pythagoras. The number four as a sign of wholeness or complete being can be encountered in various parts of life. There are the four gospels, the four elements of the Earth, the four cardinal virtues of the Middle Ages as prudence, justice, fortitude and temperance, the four ages that reflect human evolution as well as four types of consciousness, namely thinking, feeling, sensation and intuition. For instance, Tolkien embodies these aspects in the four hobbits that enter their heroic quest as priest, leader, trader and servant. Each one demonstrates a part of an archetype that needs to be individualized to reach its fullest potential and expression. One of the main strengths of Tolkien’s creative world is that he enriches Christianity with what were usually viewed as pagan elements but are indeed much needed and neglected archetypes. These forms and images are much more persuasive than arguments and reasons, which is why Tolkien’s works have struck a chord in the souls of many people as they can relate to them from a deeper psychological core of themselves. Jung himself believes that a life without archetypes of the collective unconscious is lacking while a richer and fuller life is not possible without those symbols. This may also be the reason why people are so responsive to legends and myths because they point towards a more transcendent truth, a world and reality beyond that of bare and cold facts that general science represents and espouses (with the notable exception of quantum physics). And yet Christianity itself is not averse to myth. Tolkien based his fundamental design of The Lord of the Rings on the life and resurrection of Christ; Tolkien considered this oeuvre not only to be a religious and even a Catholic work, but he based it on the “True Myth” of the death and resurrection of Christ, as a fully embodied and divine being both on Earth and in Heaven. Along a similar vein, the Ring itself becomes a union of opposites and serves as a symbol for the higher and individuated Self also aided by the symbols of fire and gold as force and durability. One of the problems with the Christian religion is in fact its defense system and paranoia against evil. By rejecting the shadow self within and by being obsessed with purity, innocence and the potential threat of sin, Christians end up projecting their own darkness onto others. As such, they rarely manage to work out their own desires and instead choose to repress them. As we know, repression is not a reliable solution to problems and issues; those hidden desires are just stacked up in the unconscious and are ready to erupt in unexpected and often shocking ways. In fact, Jung draws sharp distinctions between religion versus creed and belief. The latter is a community that is built around specialized and specific forms of thought and behavior and it thrives on dogma, rituals and traditions, all of which are there to supposedly protect its adherents from evil, but they only manage to alienate them further from their true and authentic selves. On the other hand, religion as a form of individuation is divine and is a direct experience of the archetypal psyche known as the numinosum. This Self is not bound by traditional thinking or dogma but has been paved along the way by acceptance and self-discovery. It is beyond good and evil because it embraces and accepts both in perfect harmony. That does not mean that these people are prone to evil acts or that they lack morality, but quite the opposite; they are more forceful in their actions and demonstrate peace and balance along the way because they do not have to look behind their shoulders for a malignant presence or influences at every crossroad. As a matter of fact, Jesus himself said not to resist evil. This seems rather contradictory to traditional ways of understanding Christianity but seen from Jung’s perspective, it makes perfect sense. One should not resist the shadow self but rather learn to control it by accepting some of its qualities while rejecting others. As such, this is a matter of personal moral discernment leading to a creative and transcendent synthesis. We can then harness and use this energy not only for the good of ourselves but expand it for the benefit of all of humanity. I was interested in your topic but found myself wishing you had drawn a clear distinction between your own views and those expressed by the author. Then you would have chalked up a clear score on two counts: a book review in the traditional sense of a guide to the book's content, style & quality; and more about your own views on the various prophets & gurus mentioned. As it is, I have a blurred impression about many things. On reflection, I'm convinced the fault lies not in your eyes nor mine, but in your title. "Reviving Christianity"! From another view, Christianity has been far too long dying, hanging on the cross of its own superstitions and human fallibility. Does it need to be replaced by anything? I think you are saying yes. In particular, towards the end of your piece you seem to endorse Jung's notions of individuation, archetypes—& the Self as beyond good and evil. I note that hardly any other reviews exist of Johnston's book. He writes his own blurb. The US Review of Books has a brief write-up. I wonder how it came to your attention. Your comments are astute as always, but this time, they are indeed spot on! Yes, I could have written (and even considered writing) a more traditional book review by mentioning style and structure and yes I could have drawn a sharper dividing line between the opinions of the author and my own thoughts. But I chose not to. Neither the topic nor the views in my view could have been expressed effectively in a traditional sense. Yet I do take credit for the title and I believe the author might (or might not) disagree with me. I think it is a sort of renaissance I have been going through over the past months and that title best reflected it. As to how the book came to my attention, I was contacted by a publicist and found its interesting content to be of interest for a (non-traditional) review.